One thing you can positively say about honeybees is that you don’t want to mess with them or threaten their hive. After attacking a single bee, a large fishing spider was overpowered by a horde of bees in defense of their colony. There’s footage depicting the spider getting attacked after killing one of the worker bees. Instead of getting an easy meal, the spider experienced the wrath of angry insects, learning the hard way not to invade a colony of bees. Fishing spiders normally hunt near water to trap their prey instead of webs. 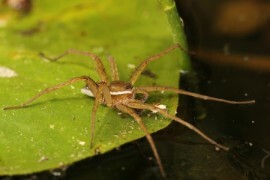 These semi-aquatic spiders are often found across North America, Europe, and New Zealand. Fishing spiders usually live near water as well and can catch small fish and other aquatic insects. The spiders usually have a brownish-grey color—their waxy, hydrophobic legs and light weight keep them from submerging in water. This also allows them to navigate through the surface tension of water to help stalk their prey without sinking or using a web. These arachnids can catch prey five times their size, so it’s fascinating to see small honeybees come together to defend their hive. The spider in this instance was on the edge of a hive while it tried to get closer to bees. The bees initially ignored the spider before dozens swarmed over and paralyzed it with their stingers. To prevent potential attacks, honeybees have sting guards for protecting the hive and coming to their defense. Bees can quickly mobilize in a large group and attack predators—when a bee is alarmed, a pheromone is released, and it encourages an attack response in other bees. There is some debate over the method of attack the bees used in this instance. Some argue that instead of stinging their attacker, the bees are actually heat balling, which is a process where insects create friction and heat around the attacker and increase its body temperature to lethal levels. This usually works on smaller predators like wasps, but American honeybees seldom use this method. It’s more likely that the bees attacked the spider with numerous stings. Even after bees lose their stingers, venom is still delivered. When a bee stings a human, its stinger gets caught and tears from its abdomen, leaving the bee to die soon after defending itself. A spider’s exoskeleton, however, doesn’t catch the bees’ stingers, which allowed the bees here to survive and sting the spider multiple times until it likely succumbed to the venom.